Got to this intermittently today and it is fine that it took me a while to get this report together. One might ask “why?”. Well, this earthquake, while having a large magnitude, was quite deep. Because earthquake intensity decreases with distance from the earthquake source, the shaking intensity from this earthquake was so low that nobody submitted a single report to the USGS “Did You Feel It?” website for this earthquake. This report let me spend some time thinking about the historic earthquakes in this region. In other reports (e.g. the M 8.2 Fiji earthquake from a few days ago) I discuss various reasons why there are earthquakes at these great depths. I will mention some of that below, but in general, we think that there are various physical and chemical changes to earth materials at these great depths that lead to changes in stress and strain, leading to earthquakes. While doing my lit review, I found the Okal and Bina (1994) paper where they use various methods to determine focal mechanisms for the some deep earthquakes in northern Peru. More about focal mechanisms below. These authors created focal mechanisms for the 1921 and 1922 deep earthquakes so they could lean more about the 1970 deep earthquake. Their seminal work here forms an important record of deep earthquakes globally. These three earthquakes are all extensional earthquakes, similar to the other deep earthquakes in this region. I label the 1921 and 1922 earthquakes a couplet on the poster. There was also a pair of earthquakes that happened in November, 2015. These two earthquakes happened about 5 minutes apart. They have many similar characteristics, suggest that they slipped similar faults, if not the same fault. I label these as doublets also. So, there may be a doublet companion to today’s M 7.1 earthquake. However, there may be not. There are examples of both (single and doublet) and it might not really matter for 99.99% of the people on Earth since the seismic hazard from these deep earthquakes is very low. Other examples of doublets include the 2006 | 2007 Kuril Doublets (Ammon et al., 2008) and the 2011 Kermadec Doublets (Todd and Lay, 2013). In January, there was a M 7.1 subduction zone earthquake and I present material about that earthquake here. I plot the USGS fault plane solutions (moment tensors in blue and focal mechanisms in orange), possibly in addition to some relevant historic earthquakes. I include the focal mechanisms from Okal and Bini (1994). I include the slab contours plotted (Hayes et al., 2012), which are contours that represent the depth to the subduction zone fault. These are mostly based upon seismicity. The depths of the earthquakes have considerable error and do not all occur along the subduction zone faults, so these slab contours are simply the best estimate for the location of the fault. However, the slab contours are only in the southwestern portion of this map. We can see the roughly east-west trends of these red and blue stripes. These lines are parallel to the ocean spreading ridges from where they were formed. The stripes disappear at the subduction zone because the oceanic crust with these anomalies is diving deep beneath the Sunda plate (part of Eurasia), so the magnetic anomalies from the overlying Sunda plate mask the evidence for the Australia plate. In the upper right corner is a section of the map from Rhea et al. (2010), which is a USGS map documenting the seismicity of the earth in this region. The cross section B-B’ is shown to the left. The cross section plots the earthquake depths along the profile shown on the map. The B-B’ profile crosses the subduction zone very close to where this earthquake happened. I place a blue star in the general location of today’s M 7.1 earthquake. In the lower right corner is a low-angle oblique view of the megathrust fault as it dips beneath the South America plate. Today’s earthquake is deeper than this figure represents (max depth = 200 km; today’s M 7.1 depth = 610 km). I place a blue star in the general location as the epicenter in the upper part of the figure (that represents topography, vertically exaggerated) and the lower part of the figure (a depth slice at 200 km, so this is kind of like a 200 km deep epicenter; not really an epicenter or an hypocenter). In the upper left corner is a map showing the location of some cross sections that Scire et al. (2017) prepared. These authors used seismic tomography to look into the subsurface geometry of the plates and mantle. Seismic tomography is like a CT-scan, a 3-D X-Ray, into the earth using seismic waves instead of X-Rays. In the lower left corner are some of these tomographic slices into the Earth. The M 7.1 earthquake happened between sections A-A’ and B-B.’ In these images, the color the velocity (speed) of seismic waves in that material. Blue= fast, red= slow. Generally, oceanic crust is old and cold (more dense, etc. and sinking) and mantle is warmer and has a lower seismic velocity. We may think that the blue bleb dipping to the east is the subducting Nazca (Farallon) plate. Here is the map with a century’s seismicity plotted, along with USGS earthquakes M ≥ 7.0. Here is an animation from IRIS that reviews the tectonics of the Peru-Chile subduction zone. For the animation, first is a screen shot and below that is the embedded video. This animation is from IRIS. Written and directed by Robert F. Butler, University of Portland. Animation and Graphics: Jenda Johnson, geologist. Consultant: Susan Beck, University or Arizona. Narration: Elayne Shapiro, University of Portland. The Rhea et al. (2016) document is excellent and can be downloaded here. The USGS prepared another cool poster that shows the seismicity for this region (though there does not seem to be a reference for this). This is a great visualization from Dr. Laura Wagner. This shows how the downgoing Nazca plate is shaped, based upon their modeling. 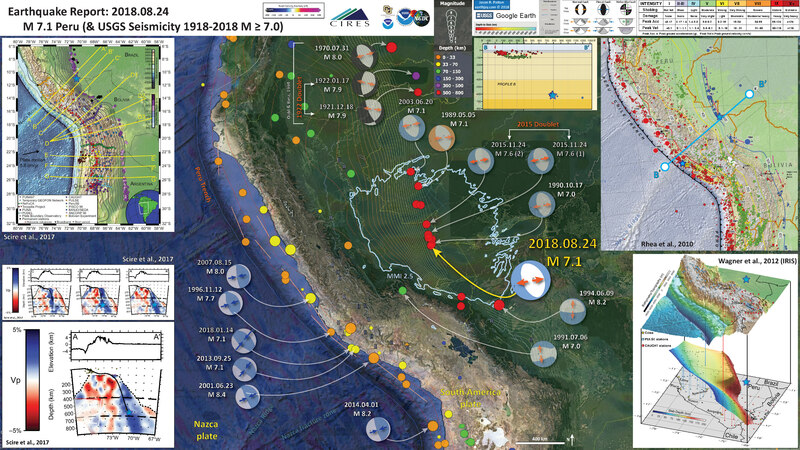 Today’s M 7.1 earthquake is almost due south of Nazca, Peru labeled on the map. Below are all figures from Scire et al. (2017). This first one shows the location of (1) their cross sections (see below), (2) the locations of the seismometers and other equipment used in this study, and (3) historic seismicity used in their analyses. 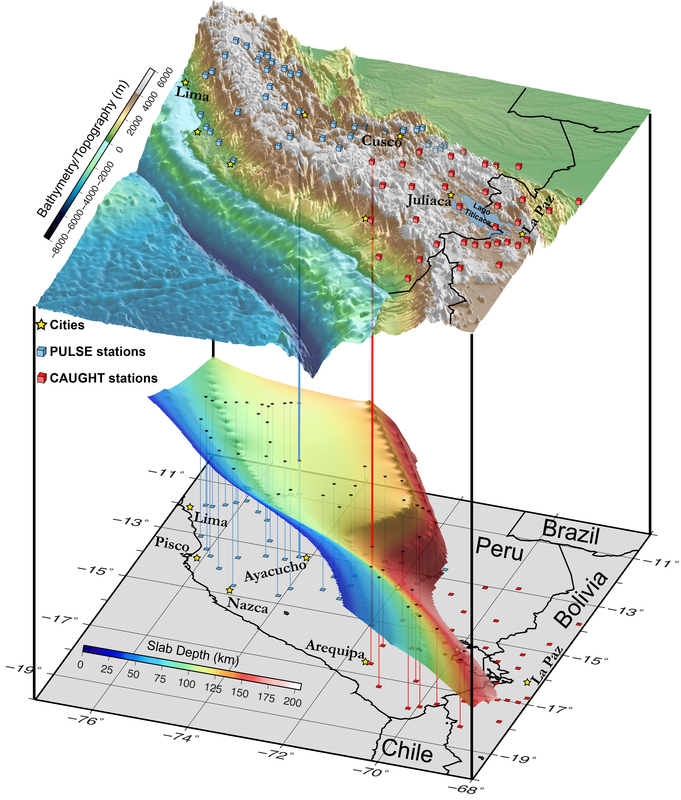 Map showing seismic station locations (squares—broadband; inverted triangles—short period) for individual networks used in the study and topography of the central Andes. Slab contours (gray) are from the Slab1.0 global subduction zone model (Hayes et al., 2012). 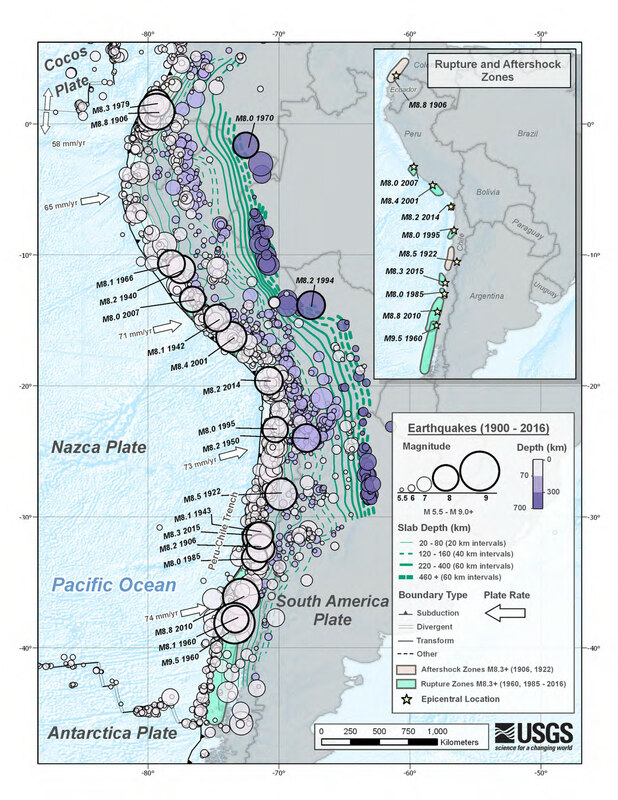 Earthquake data (circles) for deep earthquakes (depth >375 km) are from 1973 to 2012 (magnitude >4.0) and were obtained from the U.S. Geological Survey National Earthquake Information Center (NEIC) catalog (https://earthquake.usgs.gov/earthquakes/). Red triangles mark the location of Holocene volcanoes (Global Volcanism Program, 2013). Plate motion vector is from Somoza and Ghidella (2012). Cross section lines (yellow) are shown for cross sections in Figures 5 and 8. Here are all the tomographic cross sections. Trench-perpendicular cross sections through the tomography model. Velocity anomalies are shown in blue for fast anomalies, red for slow anomalies. Cross section locations are as shown in Figure 1. Dashed lines are the same as in Figure 6. Yellow dots are earthquake locations from the EHB catalog (Engdahl et al., 1998). Solid black line marks the top of the Nazca slab from the Slab1.0 model (Hayes et al., 2012). This figure that shows an estimate of the geometery of the slab (scire et al., 2016). This surface is based on a contrast between material properties of the slab and the overlying material (mantle). Note the north arrow. These authors were interested in many things, including how the Nazca Ridge changes the geometry of ht emegathrust fault. Today’s M 7.1 happened in a place where the fault is steeply dipping. Use the latitude and longitude to findthe location of today’s earthquake relativ to this figure. 11° South and 70.8° East, with a depth of 610 km. These next 3 figures are from Kumar et al. 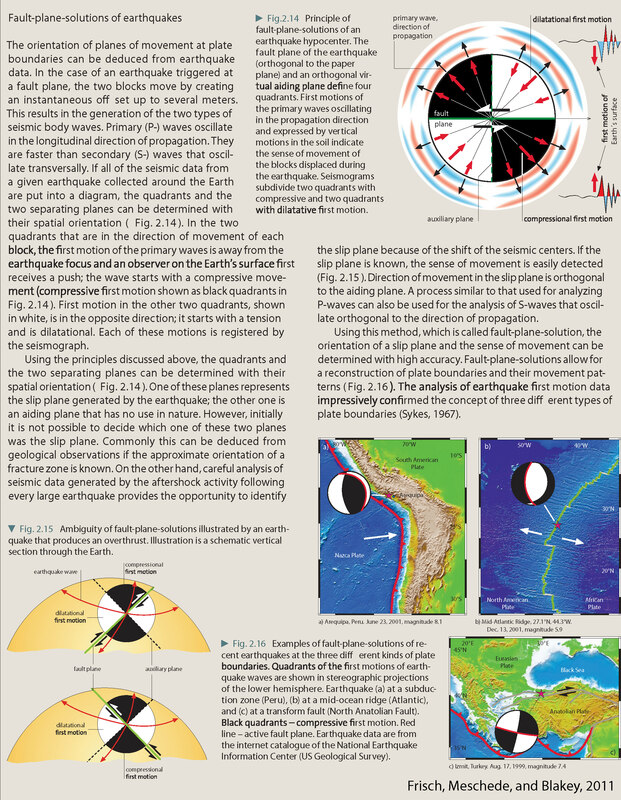 (2016) and reveal the shape of the plate boundary based upon seismicity. This map shows the earthquakes used in their study (color = depth, use this legend for the other map). The thin black lines show their estimate of where the slab is (the megathrust, where the Nazca plate meets the South America plate), depth in km. The NR is the grayed out polygon in the lower left part of the figure (see next map). Map of first motion focal mechanisms plotted in lower hemisphere projec-tion. Mechanisms are color coded by earthquake depth and mainly show normal faulting across the study area. Solid lines are slab contours from Antonijevic et al.(2015). See Figs. S4 and S5 of the supplementary material for zoom-in map of focal mechanism for events inside the red and blue box respectively. This map shows where the cross section profiles are located (Kumar et al., 2016). Today’s M 7.1 earthquake plots almost exactly at the southwestern tip of the P3 profile line. Map showing locations of (a) trench-parallel (BB) and trench-perpendicular (P1, P2, P3, and P7) transects used to plot seismicity cross-sections. Red tick marks on BBrepresents distance interval of 100 km. Here are the earthquake hypocenters plotted for the 4 cross sections plotted in the map above (Kumar et al., 2016). Today’s M 7.1 earthquake plots near the westernmost limit of profile P3. Given a hypocentral depth of ~40 km, this plots in the upper plate. So, perhaps this earthquake is not on the megathrust, but along the decollement. While plotted at a different scale, the same is true when looking at the seismicity cross section from Rhea et al. (2010). Of course, these are just models and could be wrong. Seismicity cross-sections (P1, P2, P3, and P7) perpendicular to the trench. Earthquakes within ±35 km are projected onto each cross-section. The solid line in each cross section is the slab contour from Antonijevic et al.(2015). Red star in each trench-perpendicular cross section marks the intersection with BBcross section. See Figs. S2 and S3 of the supplementary material for the remaining set of trench-parallel and trench-perpendicular seismicity cross-sections. Here is a map and a cross section showing earthquake locations for the 2015 doublet sequence (Ruiz et a., 2017). Here are some figures from Ammon et al. (2008) that shows the earthquake doublet in the Kuril subduction zone. The doublets in Peru are deep and occur for a different reason than do the shallow earthquakes in the Kuril example. For the earthquakes in 2006 | 2007, there was an earthquake along the megathrust fault and an earthquake along the outer rise (within the Pacific plate). This map shows earthquake mechanisms for historic earthquakes in this region. Color represents time. Great doublet rupture region. Central Kuril islands earthquake locations (circles) from the USGS National Earthquake Information Center (NEIC) catalogue and lower hemisphere GCMT solutions (http://www.globalcmt.org/CMTsearch.html). Epicentres are colour-coded to show activity before 15 November 2006 (grey), between the doublet events (yellow), and after the 13 January 2007 event (orange). Focal mechanisms of foreshocks of the 15 November 2006 event are grey, subsequent events are red. Focal mechanisms are plotted at the NEIC epicentres; the stars are the GCMT centroid locations for the doublet events. 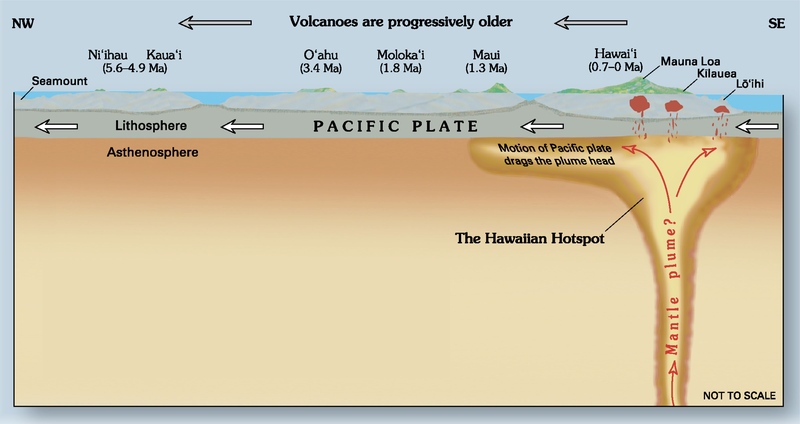 The arrow indicates the direction of motion of the Pacific plate at about 80 mm/yr. This figure shows how energy was released during earthquakes through time and space during his earthquake sequence preceding and following the 2006 M 8.3 earthquake. Seismicity pattern. Space–time seismicity pattern for the 2006–2007 Kuril islands earthquake sequence, as a function of time relative to the 15 November 2006 event and a function of distance along the trench relative to that event’s epicentre. The foreshock sequence 45 days before the November event (Fig. 1) and the two main-shock sequences are distinct in time, although many of the early aftershocks of the November event are located in the outer rise (Fig. 1) where the normal fault ruptured 60 days later. This figure shows their estimate of slip distribution (how much the faults slipped and where) for these doublet earthquakes. enlarged mechanisms are shown for the doublet events. Grey mechanisms indicate events before the 15 November 2006 event, red mechanisms indicate events after that rupture. The focal mechanism and epicentre of the 16 March 1963 compressional outer-rise event (yellow hexagon) are included. The arrow indicates the direction of the Pacific plate motion at 80 mm/yr. Bishop, B.T., Beck, S.L., Zandt, G., Wagner, L., Long, M., Knezevic Antonijevic, S., Kumar, A., and Tavera, H., 2017, Causes and consequences of flat-slab subduction in southern Peru: Geosphere, v. 13, no. 5, p. 1392–1407, doi:10.1130/GES01440.1. Espurt, N., Baby, P., Brusset, S., Roddaz, M., Hermoza, W., Regard, V., Antoine, P.-O., Salas-Gismodi, R., and Bolaños, R., 2007. How does the Nazca Ridge subduction influence the modern Amazonian foreland basin? in Geology, v. 35, no. 6, p. 515-518. Ray., J.S., et al., 2012. Chronology and Geochemistry of Lavas from the Nazca Ridge and Easter Seamount Chain: an ~30 Myr Hotspot Record in Journal of Petrology, v. 53., no. 7, p. 1417-1448. Rhea, S., Tarr, A.C., Hayes, G., Villaseñor, A., Furlong, K.P., and Benz, H.M., 2010. Seismicity of the Earth 1900-2007, Nazca plate and South America: U.S. Geological Survey Open-File Report 2010-1083-E, 1 map sheet, scale 1:12,000,000. Scire, A., Zandt, G., Beck, S., Long, M., and Wagner, L., 2017. The deforming Nazca slab in the mantle transition zone and lower mantle: Constraints from teleseismic tomography on the deeply subducted slab between 6°S and 32°S: Geosphere, v. 13, no. 3, p. 665–680, doi:10.1130/GES01436.1.